On November 22, thanks to support from Cambridge Packing, Holiday Dreams Foundation and Horizon Technology, over 15 volunteers helped to distribute the fixings needed for a Thanksgiving meal to 150 families at the Wilson School; that’s over 450 individuals! 550 students from Kindergarten to Grade 5 and approximately 80% of those students participate in the free or reduced lunch programs. For many, these school meals are essential to keeping them both healthy and focused. The remarkably diverse, low income population of students and families at the Wilson School is supported by JFS’ Reducing Achievement Gaps initiative. On November 22nd, thanks to support from Cambridge Packing , Holiday Dreams Foundation and Horizon Technology over 15 volunteers helped to distribute the fixings needed for a Thanksgiving meal to 150 families at the Wilson School; that’s over 450 individuals! 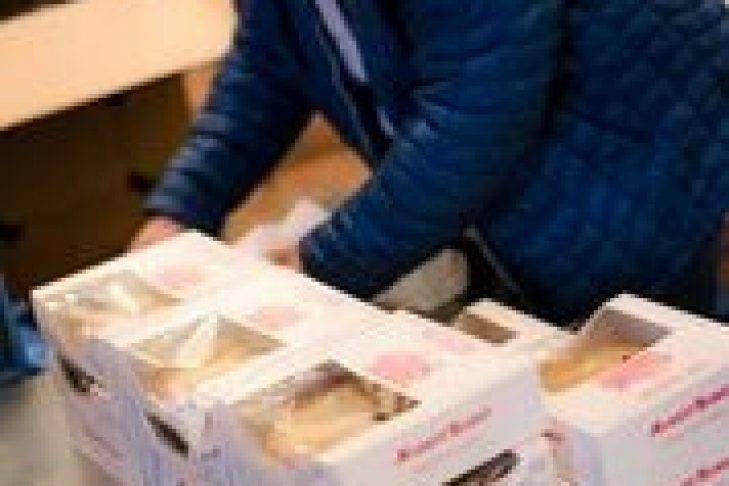 Families picked up fresh fruits and vegetables, turkey, stuffing, apple pie, and other delicious items so that they could share a meal with family and friends without the added pressure of having to sacrifice to make the meal possible. Volunteers helped pick up the food at the grocery store, package up the bags, and give out to the Wilson families. In its 5th year, this Thanksgiving distribution is truly a volunteer effort! JFS’ Reducing Achievement Gaps program is a comprehensive system of interventions to help Wilson families’ access physical nourishment and promote intellectual and emotional stimulation through tutoring and mentoring. A core component of this initiative is Healthy Harvest, a bi-monthly fresh fruit and vegetable distribution which helps provide access for families to healthy foods they may not otherwise have been able to afford. While the program targets the everyday and ongoing needs of the Wilson families, the support of Horizon Technology has allowed JFS to provide this one-time event and offer support around this holiday of giving. To learn more about the Reducing Achievement Gaps program, visit our website. Many Thanks to Cummings Foundation!